Youn Sun Nah is Korea's rising vocal star - a most formidable, versatile and higly celebrated vocalist with a wide ranging and original repertoire. She has just recorded (for April '09 international release on the German ACT label) her beautiful new album called 'Voyage', together with Swedish guitarist Ulf Wakenius and other brilliant Nordic musicians. : As the jazz world welcomes more female singers, Youn Sun Nah continues to stand out from the rest. With the support of a talented group of musicians, she has succeeded in making her mark on the jazz scene, despite being outside the typical promotional circuit. Who is she and how does she define her music? She likes to say that her group’s music is a manifestation of the best in jazz- free, without borders, constantly evolving - and drawing inspiration from French chanson, pop, and contemporary music. Youn Sun Nah is a remarkable and most enchanting jazz vocalist from Korea but with a French connection and cabaret-chanson style vocals, who since the mid nineties has made a most significant mark on the French/European and Korean/Asian jazz scene. 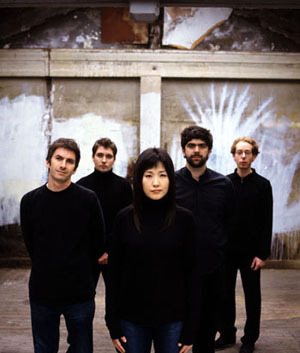 'Youn Sun Nah is a remarkable and most enchanting jazz vocalist from Korea but with French connections and cabaret-chanson style vocals, who since the mid nineties has made a most significant mark on the French/European and Korean /Asian jazz scene, and is backed by her superb French quartet of piano, vibraphones, bass and drums'. Well-received by audiences and critics alike, Korean jazz vocalist Youn Sun Nah (36) is heralded as Korea's first lady of jazz vocalism, and has also made a big impact in France, where she studied for 7 years at CIM in Paris, the first jazz school in Europe. The singer has also recently won a slew of awards for her singing. She is the first Korean vocalist to release a jazz album in France, and was the first Korean jazz singer ever to perform at the MIDEM (the world music album expo) in 2003. She also became the first Korean to win the grand prize in the Antibes and Juan Le Pang International Jazz Festival when she took the prize in July, 2005. <../img name="Youn Sun Nah" src="images/fullsize/ysnbw200.jpg" width="100" height="102" alt="Youn Sun Nah" align=right vspace=2 hspace=8 border=2>Her latest album 'So I am' with her French Quintet YSN5 on the EMI/BIS label has been rating high on the French FNAC jazz charts (Number 5 in October 2005!). 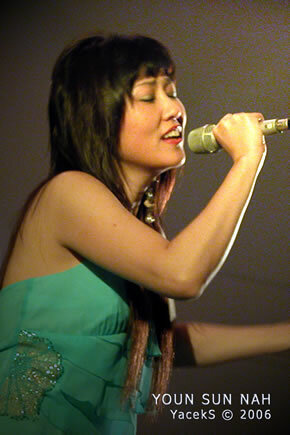 Youn Sun Nah, whose music is a melange of jazz lyricism and French chanson, will appear for the first time in Australia in late April 2006 as part of a wider Asian tour.